Anthony Crolla emerged from a conclusive fourth-round stoppage by Vasyl Lomachenko with his health and pride intact, according to promoter Eddie Hearn. 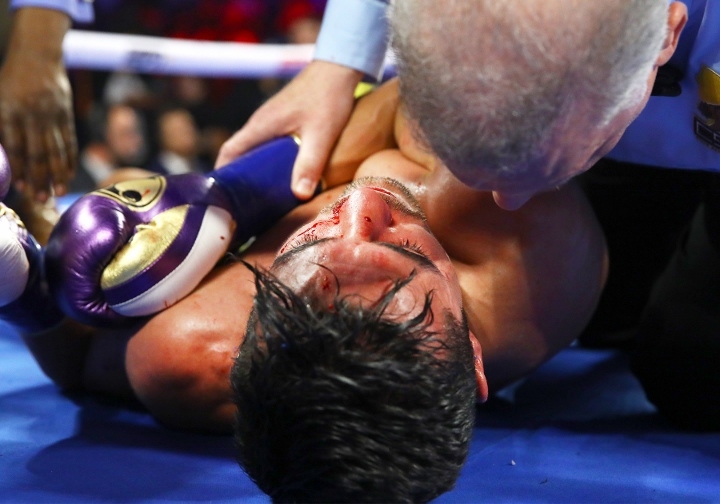 Crolla’s challenge for the WBA and WBO lightweight titles held by Lomachenko ended in brutally one-sided fashion in the early hours of Saturday morning at Los Angeles’ Staples Center. “Anthony’s fine. Obviously it was a heavy knockout – a temple shot he didn’t see,” Hearn told Sky Sports. “After he was counted out he got up and was fine. But he’s devastated. He said: ‘I’m just so gutted for the team because of the work they did’. I’m like: ‘Don’t worry about the team, you just fought pound for pound number one’. “Everybody said to him – (promoter) Bob Arum, every fighter at ringside – ‘There’s no disgrace in that, mate’. “You’re mandatory challenger, what else are you going to do? You get a shot at Lomachenko, you’ve got to take it. But he was just too good. “The third round was a weird one because he was sitting on the ropes. I thought it was a poor stoppage because although he wasn’t particularly in the fight, it was a poor stoppage. “Unfortunately in the fourth round Crolla knew he had to do something and go for it. When you do that against Lomachenko, you leave yourself wide open with gaps. Lomachenko was too good for Anthony. “This shot came against the head, you can’t not take this opportunity. Losing to Lomachenko is never a disgrace. “I want Mikey Garcia. I want to unify titles. That’s my goal. I want historic fights,” Lomachenko said.